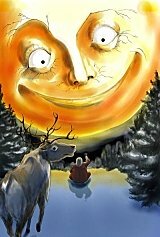 This page shows archived posts for Gary J. Wolff's blog from July-September, 2011. These peaks were climbed over 14 yrs. ago, so it's a big surprise this aging brain could recall even half these details. Given their proximity to the Tokyo metroplex, weather permitting, these awesome peaks can be easily scaled in a weekend. 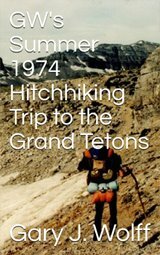 I hope you enjoy my pics, maps, & trail description. Game played Sat. 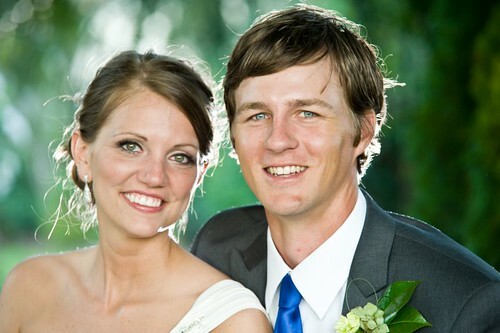 Sept. 24, 2011. Interestingly (and disappointingly), the game finished after 9 innings w/ a 5-5 tie, because of the Japanese pro baseball rule this season (due to the big 3/11 earthquake/tsunami) that no extra innings can begin more than 210 minutes after the first pitch. :-( Also, except in the playoffs, because of the fear that fans might miss their last train, Japanese pro baseball games that go 12 innings and are still tied, are halted & recorded as ties. As of Sept. 26, less than 3 weeks before the end of the 2011 season, there have been around 90 tie games in Japanese pro baseball this year. Pics taken Aug. 12-13, 1997. View entire album here. Sept. 23, 2011 - These 30 moving cinemagraphs are remarkable ! Sept. 19, 2011 - Ever seen a typhoon or hurricane tie a knot? 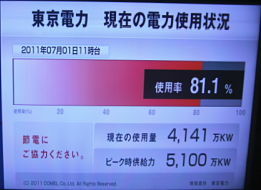 Typhoon Roke (台風15号) just pulled it off. And NOW it's making a beeline for Tokyo. Oh brother, what a CONFUSED storm! 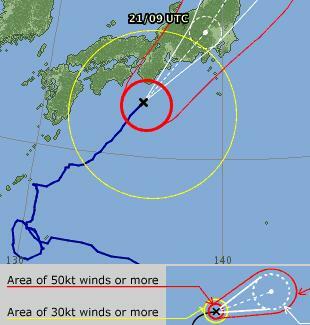 Typhoon Roke ties an overhand knot btw. Sept.
All 3 videos are in a playlist and will play continuously, non-stop. Or click on the playlist icon above to select the other 2 videos. 23:48 Bride & Claire dance to "Devil Went Down to Georgia"
Pics taken Sept. 1-8, 2011. View entire album at a glance here. This documentary was made in 2006 in Tokyo by film producer Joey Manalang for a charity concert in commemoration of the 5th anniversary of 9/11. A famous American movie star is interviewed @ the 2:05 & 9:27 min. marks. Aug. 20, 2011 - Pics, maps, and trail description of my Aug. 2011 climb of Mt. 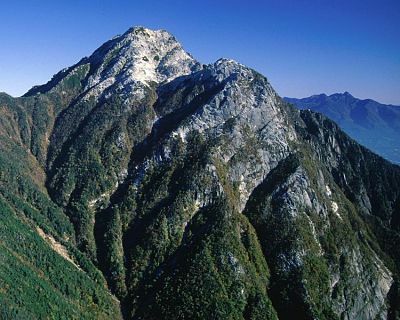 Notori-dake (農鳥岳) and the Shiranesanzan (白根三山) in the Southern Japan Alps (南アルプス). Mt. Notori-dake (農鳥岳), along with Mt. Kita-dake (北岳) & Mt. 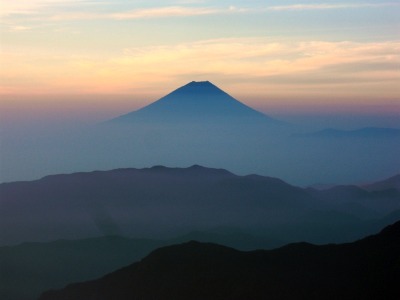 Ai-no-dake (間ノ岳), comprise Japan's Shiranesanzan (白根三山, "3 white summits"). We don't have anything even close to this in my home state of Texas, and is just one reason I love beautiful Japan. View entire photo album here. 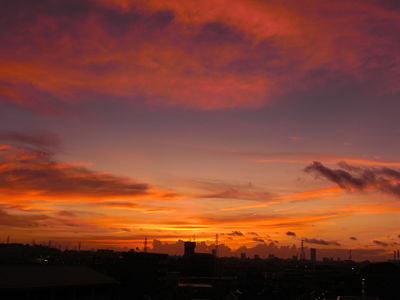 In Japan the 3rd Monday in July is a national holiday called "Umi no Hi," or Marine Day (also called Day of the Sea). This game between the Pacific League teams Chiba Lotte Marines & the Softbank Hawks was played on Sun. July 17, 2011 on Marine Day Weekend. It was an all-round good time on a gorgeous but HOT day. Enjoy a first-hand glance at Japanese pro baseball !! QVC Marine Field is located in Chiba's Makuhari area, right next to Tokyo Bay. The 131-year-old Resolute Desk, which adorns the White House Oval Office, was built of wood salvaged from the British arctic exploration ship HMS Resolute and was a gift from Queen Victoria to President Rutherford B. Hayes in 1880. It is considered a national historic treasure and an icon of the U.S. presidency. In 1852 the British ship HMS Resolute was sent to the Arctic Ocean on 2-3 year mission along with four other ships to search for missing explorer Sir John Franklin and his party who had disappeared in the Arctic while trying to discover the Northwest Passage. Unfortunately, the ship became ice bound and after two winters stuck in the thick ice, the Resolute had to be abandoned and its crew returned to England aboard another ship. For over a year the HMS Resolute drifted in pack ice as a ghost ship. In September 1855 the ship was discovered 1200 miles from where her crew left her by Capt. James Buddington of the US whaling ship George Henry. When the thaw set in, his crew managed to free the entrapped Resolute and sailed the salvaged prize back to Capt. Buddington's home port of New London, Connecticut, where, after the British Government waived all claim to her, the American Government bought her from the fortunate whalers for $40,000, a huge sum of money in those days. As a token of goodwill & friendship, the Resolute was repaired & refitted in the Brooklyn Navy Yard and in 1856 was presented to Queen Victoria and the British people on behalf of the people of the United States in the hope that it would promote peaceful relations. The Resolute served in the Royal Navy for 22 more years until she was decommissioned in 1878. When the ship was finally broken up the following year, Queen Victoria asked for 4 desks to be fashioned from the strong oak wood of the Resolute by William Evenden at the Royal Naval Dockyard in Chatham, England. She presented one of the desks as a gift to U.S. President Rutherford B. Hayes in 1880. 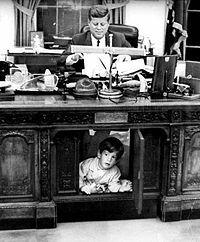 In the 131 years since then, apart from short spells in a traveling exhibition and on display in the Smithsonian Institution, the Resolute Desk has been in daily use in the White House by every president since Hayes either in the Oval Office or a private study in the Executive Mansion with the exception of Presidents Johnson, Nixon, and Ford. 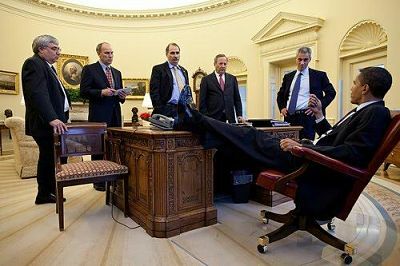 The desk was made famous in part by a photograph of Pres. John F. Kennedy at work while his son, John Jr., peeked out the front through the kneehole panel. The Resolute Desk has sealed a lasting friendship between Great Britain and the United States. July 5, 2011 - Creation Calls -- are you listening? can be ordered from Amazon for only $1.99. Mt. Fuji's official 2-month climbing season opened July 1st. Reminds me of the old Japanese proverb: "If you come to Japan and don't climb Mt. 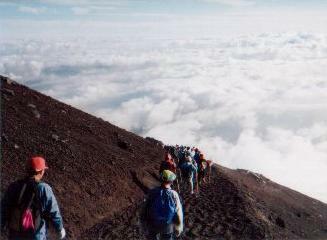 Fuji, you're a fool; but if you climb it more than once, you're an even BIGGER fool." Cracks me up....every time. If you know anyone interested in climbing Mt. Fuji, they might be interested in my Climbing Mt. Fuji - Frequently Asked Questions page. And pics from my Aug. 3-4, 1991 climb of Mt. Fuji are hosted @ Flickr here. Got an email last night from a good bud living in LA, who said he & his girlfriend are headed for Glacier National Park, Montana today. Reminded me of the magnificent summer I spent working there, so I dug up this pic from the archives. 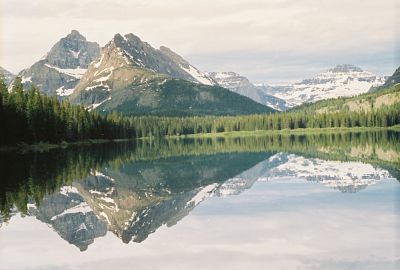 Glacier NP, together with the adjoining Waterton Lakes NP on the Canadian side of the border, form the Waterton-Glacier International Peace Park, the first-ever park in the world spanning an international border. Without question, Glacier National Park is one of the most strikingly beautiful places I've ever seen on God's green earth. More pics taken Aug. '09 by my daughter & her husband are here.